Stage 5 covers mixed terrain across Sicily: flats in the first half, across the Valley of the Temples and the Scala dei Turchi up to Selinunte, and hilly in the second half. There are three categorized climbs in the last 60 kilometers in and out of the “crater” caused by the earthquake in Belice. The final kilometer is uphill, with a very steep climb leading to Santa Ninfa, so expect victory from a climber or puncheur. The town and surrounding areas have been reconstructed following the devastating earthquake in Belice in 1968 that killed 400. Enrico Battaglin negotiated a tough, sketchy finale Wednesday to win stage 5 of the Giro d’Italia, his third career stage win at the Italian stage race. 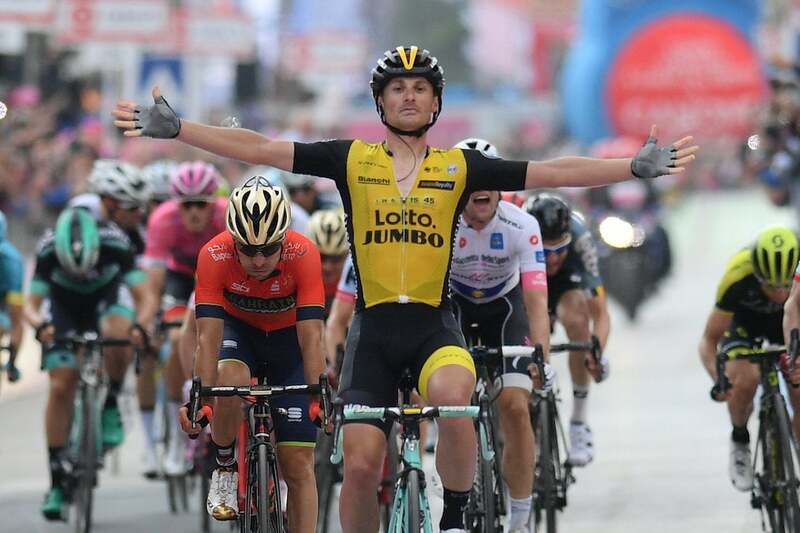 LottoNL-Jumbo’s Italian beat Giovanni Visconti (Bahrain-Merida) in the final meters into Santa Ninfa. Jose Goncalves (Katusha-Alpecin) was third to Visconti. Rohan Dennis (BMC Racing) finished in the bunch, maintaining his one-second overall lead ahead of defending champion Tom Dumoulin (Sunweb). 2. Giovanni Visconti (Bahrain – Merida), s.t. 3. José Gonçalves (Team Katusha Alpecin), s.t. The 153km stage was mostly flat for the first half and then rippled with three categorized climbs as it approached the finish. “It was quite slow in the headwind and there was a little bit of stress every now and then but my body felt good so I felt good,” said Dennis. Laurent Didier (Trek-Segafredo) was first to attack out of the day’s four-man breakaway. He had benefitted from the presence of teammate Ryan Mullen in the escape. Andrea Vendrame (Androni Giocattoli) covered Didier’s move and then counterattacked. Although the peloton was delayed by a crash on the narrow Sicilian roads, with around 14km remaining, The bunch caught the Italian’s solo attack with 3km to go. Maximilian Schachman (Quick-Step Floors), leader of the best young rider classification, was delayed by that late crash, but thanks to a valiant chase, he rejoined the group. On the other hand, another GC hopeful, Miguel Angel Lopez (Astana), lost touch with the peloton in the closing kilometers after careening off the road. Fortunately, he landed in the grass and appeared uninjured. He did not manage to finish with the group. Up the final, short climb to the line, Tosh Van der Sande attacked, following some hard work by his Lotto Fix All team to drive the pace. Domenico Pozzovivo (Bahrain-Merida) was quick to follow the move. Next, Jack Haig (Mitchelton-Scott) went to the front as the hill crested and the road led into the final kilometer. Fast finisher Diego Ulissi (UAE Team Emirates) hit out, setting up his teammate Fabio Aru to lead the bunch into the final sharp corner, a right-hander that was more than 90 degrees. Visconti emerged with a small gap, but Battaglin had plenty of fight left to ride onto his countryman’s wheel and then sprint clear on the inside of a gradual right-hand bend into the finish. “The finish was a little bit different than yesterday,” Battaglin said. He finished third in stage 4 Tuesday. “Yesterday was a powerful sprint, a really steep climb. “I had a little bit of time to rest and recover and do a sprint,” he added about stage 5’s finish. 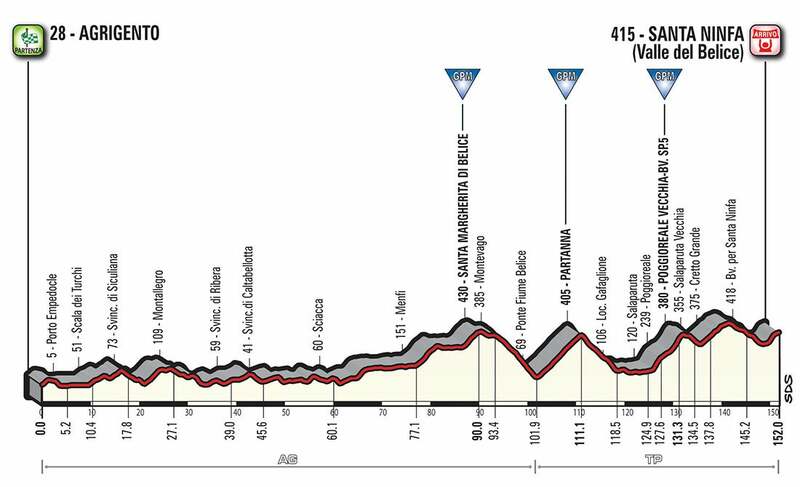 Thursday’s stage 6 should afford the first true climbing challenge for GC hopefuls with a summit finish on the volcano Mount Etna after 164km of racing. After finishing third on stage 4, Enrico Battaglin brought his A game again on stage 5 ,leading the group to the finish in Santa Ninfa Valle del Belice.